Five Tips to Ensure A Successful Big Game Party! You’ve stayed loyal the entire year watching your team at their best (and worst). If you’re lucky, you were able to watch your team into the playoffs and possibly the divisional championship! Regardless, whether your team is heading for greatness or was sent home at the end of regular season, the Big Game is coming for ALL to enjoy. 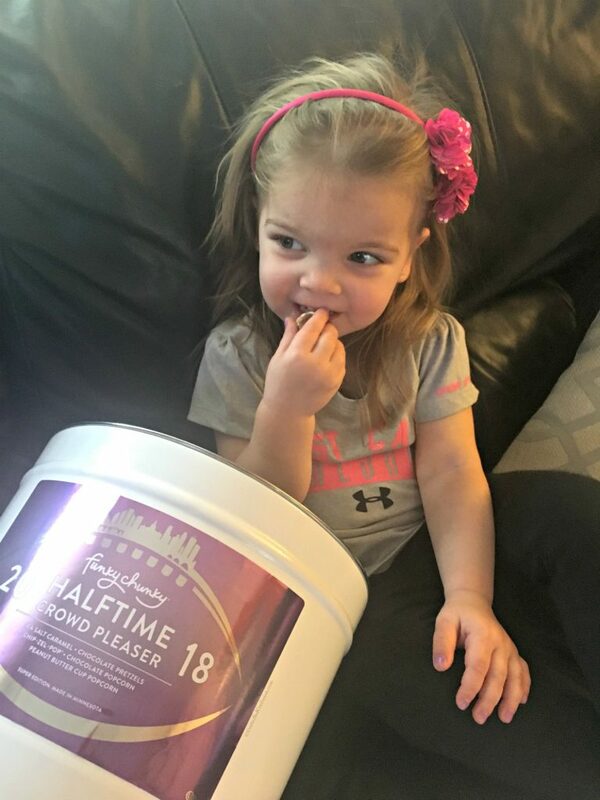 We are a huge football family, which means lots of excitement and prepping for the Big Game. While being a host of the biggest game of the season may feel overwhelming, it can be the most entertaining party you throw all year! Here’s our top five tips on how to ensure a successful Big Game Party! Optimize the perfect guest list. While its true, you are hosting the Big Game party, a crucial part of the fun is being able to actually watch the game. Make sure your guest list includes people who are also interested in watching the game and won’t be looking for you to entertain them while the game is broadcasting. *Side note- keep the crazy fans to a minimum. 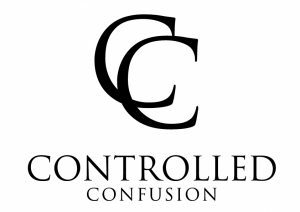 Its never any fun to have a constant complainer for every down who thinks they’re the next Vince Lombardi and the current coaching staff is sub-par. Space is critical. Not that you need to have a huge house in order to host the Big Game party, but you want to make sure there are enough seats for everyone. The last thing you want is to have ten friends piled up on the floor in your living room rubbing elbows. Grab some extra folding chairs to account for the number of bodies that will be attending and more importantly, watching the game. Show support for your team by purchasing plates, cups, and napkins with their emblem. Especially if your team is heading to the Big Game, you want all of your guests to have team spirit! For those of you watching different teams in the Big Game, you can find generic football themed party supplies. Time your food right. Set out your first round right before guests start to arrive. If you’re planning to have any hot food, time it to come out right before the game starts, or right after halftime to ensure you’re not standing in the kitchen the entire time. Take your food to the next level by incorporating new snacks. This year, we decided to step up our snack game and step out of the kitchen with gourmet popcorn from Funky Chunky. 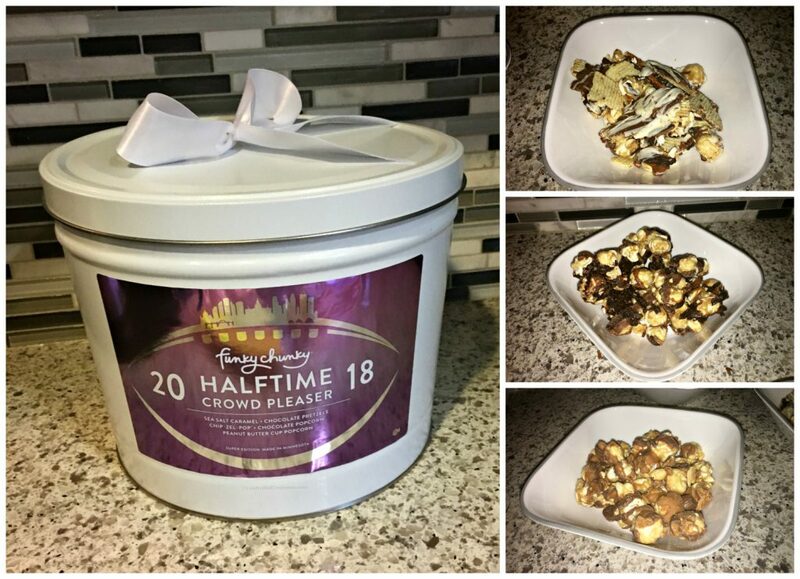 To keep in line with the Big Game theme, we opted for the Limited Edition Halftime Crowd Pleaser tin, which features five flavors: Chocolate Popcorn, Chocolate Pretzels, Peanut Butter Cup Popcorn, Sea Salt Caramel Popcorn and Chip-Zel-Pop. 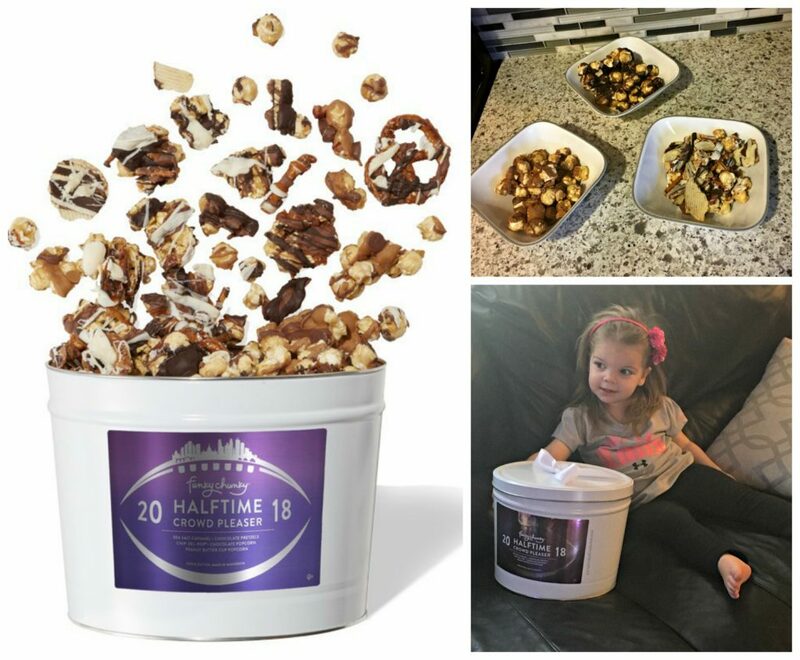 The unique combination of chocolate, pretzels, and nuts makes the Halftime Crowd Pleaser tin the one stop shop for any snacks you’ll need. **Now through Feb 4, YOU can snag the five 10 oz bags of gourmet popcorn for only $48! Check out Funky Chunky to receive the limited time offer! Our team may not be in the Big Game this year, but we’re still excited to get together with some of our closest friends and enjoy the action! What will you do to ensure your Big Game Party is successful?